The Hemingway Affair safari is a tribute to Africa’s tendency to grab hold of our hearts. It is a contemporary throwback to the old-fashioned and cosy safaris of Hemingway’s time and straddles two luxurious tented camps. Spend your first three nights on this captivating safari at the exquisite Ngala tented camp. While this camp never lets you forget that you are in the wild, there is nothing primitive about this chic and contemporary camp. The romance of canvas, with big night sounds and flickering lanterns lighting the campgrounds, mingles with the simple sophistication of polished wooden decks, textured fabrics and clean lines. Ngala is a true safari experience where guests go to bed to the sounds of lion calling, safely cosseted in modern tented suites and pampered with the warm-hearted service that embodies the soul of Africa. The second tented camp on the Hemingway Affair safari is a three-night stay at the breathtakingly beautiful Sanctuary Puku Ridge camp, perched on an escarpment overlooking a floodplain in the South Luangwa National Park in Zambia. The panoramic views of Puku Ridge Camp are astounding. Built on a hillside, it provides stunning vistas of the floodplain. Lying nestled in a remote game-rich area of the park, lion, leopard, elephant and zebra can frequently be seen. Sanctuary Puku Ridge is authentic in every way, guaranteeing a private, exclusive bushveld escape, unfettered by unnecessary modern interruptions. Reminiscent of an Out of Africa experience, the next camp on your itinerary is simply spectacular. You will board a short, chartered flight to the Relais and Chateaux-accredited Duba Expeditions Camp in the Okavango Delta that will charm you from the get-go. Duba Expeditions Camp is the place that the owners and National Geographic filmmakers, conservationists and explorers, Dereck and Beverly Joubert call home. A chartered flight will take you to the breathtakingly beautiful Hoanib Skeleton Coast Camp where you will spend three nights. 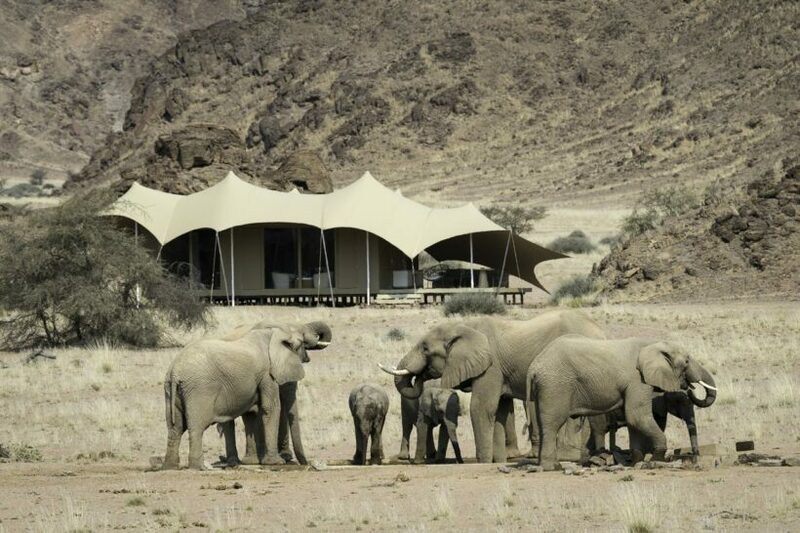 Situated in one of the most remote areas of the Kaokveld of the iconic Skeleton Coast – the Palmwag area – your stay at this Camp will, without a doubt, be one of the highlights of your trip. The location is as stunning as it is remote and as epically beautiful as it is unique. The diverse activities on offer showcase spectacular scenery, unexpected oases and enormous sand dunes while the vast, remote, isolated wilderness offers excellent viewing of Namibia’s distinctive desert-adapted wildlife. You will commence your safari of a lifetime by boarding a short flight to the impeccable Ngala Tented Camp, situated in the game-rich, Big 5 Timbavati Game Reserve. While Ngala Tented Camp never lets you forget that you are in the wild, there is nothing primitive about this chic and contemporary camp. The romance of canvas, with big night sounds and flickering lanterns lighting the campgrounds, mingles with the simple sophistication of polished wooden decks, textured fabrics and clean lines. Ngala is a true safari experience where guests go to bed to the sounds of lion calling, safely cosseted in modern tented suites and pampered with the warm-hearted service that embodies the soul of Africa. Caught between the dense riverine forest and the sandy bed of the Timbavati, extensive viewing decks give onto the river, giving guests a frontline view of game wandering down to drink. A rim flow pool mimics the contours of the river bed, inviting in for a refreshing dip. Plush armchairs beguile you to spend a lazy afternoon idly gazing into the river bed. At night, when tales of the day’s adventure are shared and compared, a roaring fireplace springs to life. The stirring scents of Africa’s famous spices waft up from a meal shared in a spectacular setting – among islands or reeds in the dry Timbavati riverbed, beneath the canopy of massive trees or on our expansive deck. After a relaxing three nights at Ngala Tented Camp, you will continue your journey by flying via Johannesburg to the breathtakingly beautiful Sanctuary Puku Ridge Camp, situated in the spectacular South Luangwa National Park in Zambia. The panoramic views of Sanctuary Puku Ridge Camp are astounding. Built on a hillside, it provides stunning vistas of the floodplain. Lying nestled in a remote game-rich area of the park, lion, leopard, elephant and zebra can frequently be seen. The camp has been constructed to blend into the local surroundings and designed to leave the lowest possible carbon footprint. Each of the seven safari tents has picture windows and its own viewing deck overlooking the plains where game amble across for a drink of water. Generous and comfortable, each tent has an en-suite bathroom with bath tub and shower, as well as an outdoor shower shaded by forest, all stocked with environmentally friendly products for your pure indulgence. Watch the sun rise from your double bed, elephants bathing from the comfort of your bath tub, perhaps even wild dogs making their way across the plains in pursuit of prey from your private viewing deck. A short shared chartered flight from Livingstone to Kasane will connect you to your chartered flight to one of our favourite and most distinguished lodges, the Relais and Chateaux accredited Duba Expeditions Camp in the Okavango Delta, your home for the next three nights. Duba Expedition Camp sits in the heart of classic Okavango Delta floodplains habitat, traditionally an ecozone that has the best wildlife viewing potential, this 77,000-hectare private concession typifies the region’s unique landscape. The intimate camp consists of six expedition-style tents of light airy canvas on slightly raised decking, each with views of the surrounding floodplain. Each tent is stylishly furnished and designed by Dereck and Beverly, using their sensibilities of the ‘expedition’ and ‘exploring’, offering campaign writing desk and private verandah plus en-suite facilities consisting of a flush loo, double vanities and indoor shower. Duba Expedition Camp prides itself on its extraordinary wildlife experiences, and rightly so. The diverse wildlife experience is renowned for regular sightings of a diverse range of species, including large herds of lechwe, kudu, tsessebe and giraffe. Very large herds of elephants and buffalo move around the camp and hippo trudge through the swamps creating their channels and paths daily. Lions, leopards and hyenas in large numbers make up the predator components. Leopard, and a wide range of smaller nocturnal cats, hunt around the fringes of the waterways and are often seen on our night drives. Enjoy guided walks, boating opportunities or open-air game drives and revel in the delights of one of the most varied and expansive wildlife areas in the world. Today you will commence your journey to the land of the brave and most definitely a land of breathtakingly beautiful contrasts – Namibia. A shared chartered flight from Duba Expeditions Camp will fly you via Maun to one of Windhoek’s hidden jewels – The Olive Exclusive, where you will spend one tranquil and affluent night. Such are the creature comforts that you may find it hard to leave: sink into an extra-length bed dressed in crisp, pure-cotton linen, or indulge in a bubble bath in a freestanding tub with sweeping mountain views. Air-conditioning & satellite TV are standard, as is a computer with free WIFI access. Then there’s a fully stocked mini bar, complete with a premium wine selection, so you can toast the setting sun in fine style. Today you will commence your journey to one of the most breathtakingly beautiful places on earth. A shared chartered flight will fly you to the impeccable Hoanib Skeleton Coast Camp, where you will spend the next three nights. In a remote area of the Kaokoveld, in a land of bare mountains, gravel-strewn plains and dry riverbeds that draw fascinating wildlife, lies Hoanib Skeleton Coast Camp. Both the eight large en-suite tents (including one family unit) with shaded outdoor lounges and the main area and swimming pool look out over rugged scenery: a wide valley that slopes down to the almost-always dry Hoanib River. Explorations of this isolated yet diverse area take place via game drives along the riverbed’s narrow ribbon of vegetation, where a surprising wealth of desert-adapted wildlife can be found: elephant, giraffe, gemsbok and springbok, with glimpses of lion and brown hyaena. The Skeleton Coast with its desolate rocky coastline, noisy colonies of Cape fur seals and remains of shipwrecks is accessed either by a fascinating drive or scenic flight, depending on the weather. The camp is fully solar powered and a joint venture with the neighbouring Conservancies of Anabeb, Torra and Sesfontein. All good things must come to an end, but not without unforgettable memories made for a lifetime to remember. After a succulent breakfast, you will fly back to Johannesburg via Windhoek, from where you will start your journey back home and start planning your next African Safari!